Teddy Rosenbluth, reporting for UCLA's Daily Bruin infosite has reported that a satellite built by 250 UCLA undergraduate students over the course of nine years successfully launched into orbit last Saturday morning. Photo is courtesy of the UCLA Newsroom. 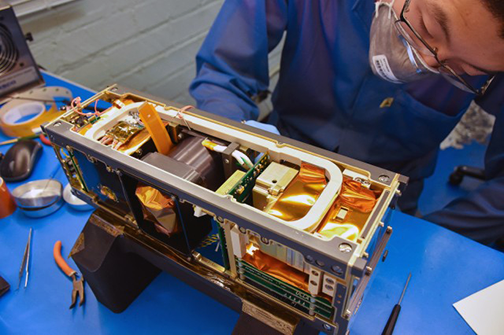 The Electron Losses and Fields Investigation (ELFIN) is the first satellite built and operated entirely at UCLA. The program is currently comprised of around 40 undergraduate students, who designed, manufactured, and tested the satellite, plus three faculty members who mentored the students. ELFIN launched from Vandenberg Air Force Base. The satellite will help scientists monitor magnetic storms near Earth, which many experts still struggle to accurately predict. These storms can send electromagnetic waves to the Earth and damage satellites used to gather information for GPS and weather monitoring. The satellite is expected to stay on orbit for two years, at which point the satellite will burn up in the atmosphere. Until then, students will control and track the satellite via an antenna on top of Knudsen Hall at UCLA. The ELFIN website will also allow the public to listen to the satellite as it orbits over UCLA twice a day. The mission was funded by the National Science Foundation and NASA’s CubeSat Launch Initiative, which funds small satellite projects from universities, high schools and nonprofit organizations in the United States.